Maybe landing at an airport was a bad idea. So, the travelers land in 1966 London Gatwick airport right smack on the runway. If I’m not mistaken, they’ve landed on a runway briefly before, in one of the Dalek chasing episodes. But this time they stay, only to have Jamie flee in terror away from a “flying beasty.” While mildly amusing at first, I’m glad he only mentions the beasties one more time because it could become annoying pretty quickly. At any rate, there are very few interactions with the airplanes. But here’s my question. Why didn’t they look at the monitor? “Oh, we’re on an airport runway, there are planes everywhere. This looks like a great place to go out and explore!” Not the best decision they’ve ever made. But, I suppose they have made much dumber exploration choices so I can’t complain too much about that. What I can complain about, though, is how painfully long and boring this story was. I thought the 6-episode story had gone the way of Dodo (see what I did there? ), but apparently I was wrong. The premise of the story was great (Invasion of the Body Snatchers pod people in a location as inhuman and cold as an airport? nice work. though, admittedly, not entirely original.) and there are some definite bright points (the first appearance of the faceless ones, for example, is genuinely creepy). However, the search for what was going on in the Chameleon Tours hangar lasted just a tad too long. Like about 2 episodes too long. I found myself checking Twitter and playing Angry Birds during episodes 5 and 6. When episode 4 started, I couldn’t believe there were 3 more episodes. The truth of the matter is I started this story way back in January when I was on a mini Doctor Who roll, but I kept falling asleep and eventually gave up (my doctoral exams scheduled in March and April didn’t help). Now I know why I couldn’t make it through. Ready for a new face! Somehow, they have kidnapped 50,000 teenagers and only one — ONE! — has been reported missing. That missing kid’s sister, Samantha, is at the airport and helps the gang unravel the mystery. Very. Slowly. In order to transport all of the originals back to Chameleonus or whatever planet they come from, they miniaturize the people and put them in drawers, a la The Ark. The Doctor solves the mystery and everyone is saved. Even the Chameleons are granted clemency and allowed to return to their home planet and find some other way to get faces. The Doctor even offers to help. While the story was too long, it showcased Jamie’s and the Doctor’s strength. I like Jamie. As soon as his innocence completely fades (“Look out! A flying beasty!”), I think he will be quite enjoyable. Also, Troughton’s Doctor has fully grown on me. I’ve gotten into his mischievous, witty groove. And in an odd way, I kind of buy him as a younger, refreshed version of Hartnell’s doctor. It took a little bit to get there, but I could see this man becoming Hartnell in old age when he’s just as clever but not really able to move quite as quickly and starts to get grumpy. Patrick Troughton would definitely wear that sweet hat Hartnell wore during the French Revolution. Polly and Ben didn’t really have much to do in this story. Ben spent a lot of time missing and Polly was chameleonized. This is probably for the best since it was their final story and Jamie needed the opportunity to shine. Also, the Wikipedia tells me that Samantha was asked to remain on as a companion, but she refused. As the story was going on and I realized this would be Polly and Ben’s last (They were in London in 1966. It was kind of obvious), I thought she was going to be sticking around. I even kind of hoped. She complemented Jamie well and was clearly written to be a companion. But, no such luck. Anyway, Polly and Ben left, it wasn’t very surprising. I liked Ben a lot, he was very no-nonsense. Polly I liked a little less. But, she was hot. The first hottie companion, which, if I’m not mistaken, is the path the show would take with most of the rest of their female companions. Probably a good choice. It turns out, it was the exact same day (July 20, 1966) that they had previously departed with the Doctor so it would be as if they were never even gone. Now, this brings up some potential time travel paradox stuff. While the Doctor is running around Gatwick Airport, somewhere in another part of the city he is defeating WOLTAN. There are also two Polly and Bens. What if Polly and Ben go back downtown before they leave? They could see themselves and rip a hole in time-space continuum. Or, what if Troughton were to somehow meet Hartnell? All hell would break loose at that point, I’m sure. And, it seems like WOLTAN taking over the world’s computer systems would be news and Commandant would be concerned about all this Chameleon Tours nonsense happening at the same time as a major computer changeover. And, if this is an alternate Earth rather than the same Earth, there would be two Polly and Bens forever. Convenient plot device, terrible consequences. Goodbye, Ben and Polly. Don't look so sad. I want to start right off by saying I really liked this story. 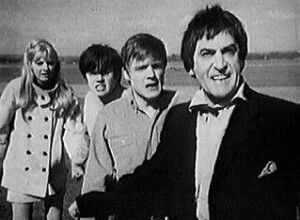 It has a lot going for it, the intersection of a few themes, Jamie finally steps up, and Patrick Troughton gives, I think, his best performance thus far. And we have a new intro! I was wondering when it would change, I didn’t expect it mid-season. I have to admit that the picture of Patrick Troughton is kind of creepy, but it’s a good change and the update of the graphic improves the overall look. The change/improvement was a reminder that the show will eventually move into a more modern time. Color must also be coming soon, I think. At the Colony. Note Polly's new short hair. Hot. So, the travelers arrive at The Colony just as the police are chasing Medok, some apparent criminal. As can be expected based on earlier stories, the criminal is, of course, the good guy. His crime is telling people about the Macra, terrible beasts that he say are hanging out in the Colony. Those in charge, led by the Pilot and the Controller and Ola, Chief of Police, all claim he’s crazy. Meanwhile, we learn that everyone in the Colony is super happy to be working and living and their schedule is punctuated by music. The travelers are given a buff and a shine in a scene reminiscent of Dorothy and friends arriving at the Emerald City in the film version of the Wizard of Oz, and then told that they are happy, but Jamie doesn’t like the look of things. He’s apparently smarter than he looks. It turns out that the Controller, who appears as a still image on a large video screen (similar to Big Brother in the film version of 1984), sends them secret messages while they sleep. “you like to work. You are happy. The Colony is good. The Controller knows best.” All in a nice, soothing voice. Ben falls victim, Jamie is too smart to be duped by such nonsense, and the Doctor saves Polly. Apparently these voices make people think that because they get what they want and the sing and dance that everything is alright and they are happy. This is an interesting theme that I think was done well. Of course, it’s kind of like consumer society. As long as we get what we want and can freely spend our credit..i mean money…we tend to look the other way and ignore the ways we are being controlled. We remain hypnotized in a way by the culture industry. What went on to be interesting about this was the Doctor’s understanding of the Macra, who were responsible for the state of things. He describes them as a bacteria or a parasite that got into the brain of the Colonists. An infection of sorts. I found this theme and commentary to culture to be brilliant. Well done, Ian Stuart Black. The Macra. Very scary. And delicious with some Old Bay Seasoning. 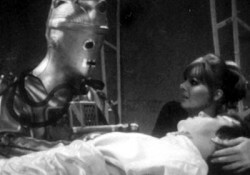 The travelers, known to the Colonists as the Strangers (another brilliant choice that conjures thoughts of propaganda automatically inclining the people against them), begin to think Medok is correct and he shows the Doctor a Macra. 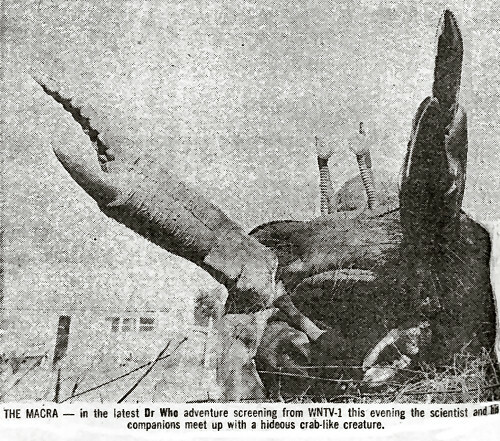 The Macra are large, crab-like creatures with glowing eyes. Ben, seduced by the soothing messages of the Controller, turns on his friends and beings helping the Colony (a word which also reeks of unwanted invasion and occupation). Jamie, Doctor, and Polly are sent with Medok to the mines (isn’t there a better form of punishment than mines….think of something new already!) where they are releasing a dangerous gas from underground. In an amusing scene, Medok is struggling mightily to get some tube in the wall while Jamie and Polly, rather than helping, are off looking a door to another mine shaft. Some help they were. Jamie runs off into the old mineshaft, followed closely by Medok. Meanwhile, the Doctor discovers the secret formula of the gas. Proud of himself for figuring it out, he says “I think I’ll give myself a 10 out of 10.” When he learns it took the Colony’s computers years to prefect the formula he changes his grade to an 11/10. Ha! 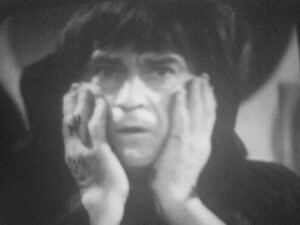 I’m starting to warm to Troughton’s humor and his portrayal of the Doctor. It’s taken a while, I think I just needed a story I enjoyed to get used to him. Did you guys just see the giant claw attack that old dude?! It turns out that the Macra are really in control and they need the gas to breathe. They’ve been fooling the Colonists. 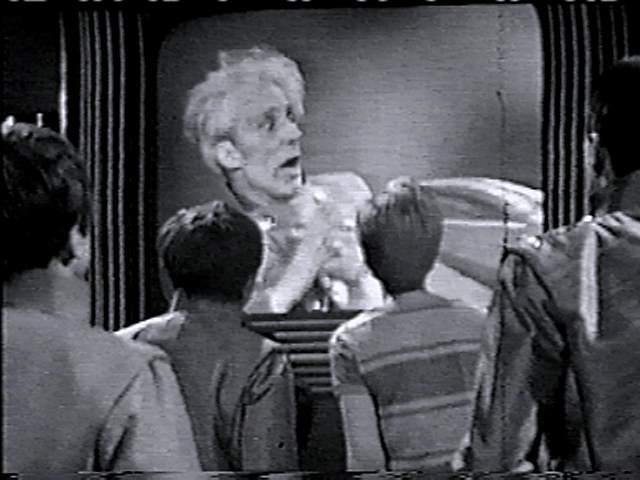 In one great scene, Jamie challenges the image of the Controller saying “that’s not really you!” So, they show a picture of some old man talking and when he doesn’t perform a giant Macra claw comes in and attacks him while everyone looks on. This, however, was not enough to convince the people. 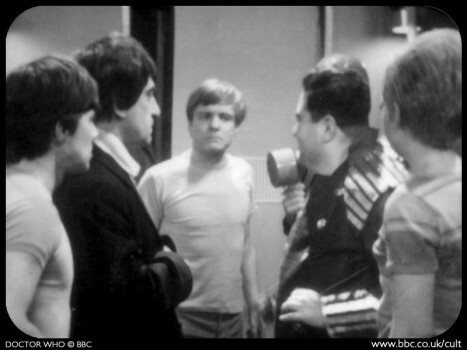 Instead, the Doctor takes the Pilot to the Control room and shows him a Macra sitting there. In the end, the gas the Macra need is withheld and the Colonists get their brains back. The Doctor and his friends dance away. The performances of all the leads were, I felt, quite strong. Jamie shows off his bravery and intelligence for the first time, really taking in the lead after Ben was hypnotized. Troughton gave a performance I could take seriously. Polly continued to be the damsel, not really doing too much, but always being there and chiming in. Ben’s performance was probably the weakest, but that was because he was meant to act like the guest cast, which he did just fine. 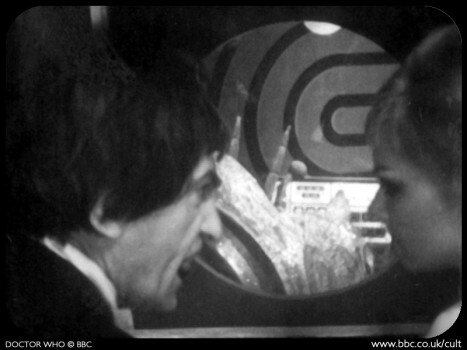 In short, the best Ben and Polly story since the War Machines and the best Troughton story yet. It makes me optimistic for upcoming stories. And the Faceless Ones, up next, actually has two complete episodes. Which I plan to watch on my Lost In Time DVD Set that I received for Christmas. Awesome. I first watched this story back in September, shortly after my post on The Highlanders. But I hated it. A lot. So, I didn’t write about it. I started to rethink my approach to the show for the first time. It’s tough to find the motivation to watch when I’m not going to feel like writing about the bad stories. I thought maybe I would just skip ahead. The reconstructions are rough and, let’s face it, the show simply isn’t very good at this point. Then, I got busy and generally forgot about these adventures. When I sat down to finally write my thoughts on the Underwater Menace, I found that I couldn’t really remember much about it. So, I watched it again in a single sitting. And it still sucked. But I’m writing immediately, with plans to move on to the next story right away. So as to not lose momentum. The travelers land on a deserted beach and are promptly taken prisoner, down an elevator into what turns out to be the lost city of Atlantis. There they are to be sacrificed to the goddess Amdo, but the Doctor has a plan. He has heard of the famous Professor Zaroff and his method for converting plankton to food. It seems that he has promised the Atlantians that he can raise the city from the sea. Now, this bothered me. They had access to the surface, as evidenced by the kidnappers and the elevator. If they wanted to be on the surface, why didn’t they just go there? Later, they mention that they take shipwrecked people, so clearly civilization exists. Polly finds a bracelet from the 1968 Mexico City Olympics. So, why are they eating plankton? This bothered me enough that the entire premise of the story was too lame for me. If this were an alien planet, or there was no life on the surface, cool. But, no….it was near the surface of the apparently normal 20th century. A character even recognizes the police box at the end of the story. At least do SOME work on your story invention, please. 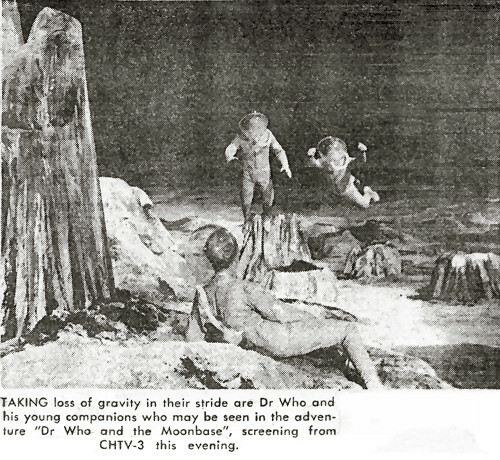 So, the doctor chills with Zaroff, Ben and Jamie are sent to some mines (not sure what was being mined or why — mines are apparently the default punishment for prisoners in this era of the show), while Polly is going to get some surgery to turn her into a fish. Now Zaroff is, outside of the principle actors, the lone bright spot in this story. He is delightfully mad. We don’t quite get the same descent into madness as Chen in the Daleks’ Master Plan, but he is comically loony. He plays the role of the mad scientist perfectly, especially in the final episode. His plan is to drain the oceans into the Earth’s core, turning it to steam and destroying the planet. And at the end, as he attempts to enact his evil plot, he has clearly lost his marbles. His character is a delight, though not really worth the climb of watching the rest of the story. The fish people, on the other hand, are totally lame. They are essentially a rehash of the Menoptra in the water and they don’t talk. There is a particularly irritating scene during the third episode in which they swim around and wave at each other, causing a strike and depriving the city of food (although the people could have just gone to the surface and got some themselves). They have shiny fake scales all over their bodies and are clearly not swimming, but being dragged around by cables. I honestly felt like I was watching something on the local cable access channel. I know the budget was low and the technology was limited, but really? This is what I get? I’m not sure why I hated them so much. I’ve found the poor effects to be endearing in earlier stories, but they bothered me this time, perhaps because the story itself was too weak to overcome them. Or maybe because the long swimming scene was too long. They let me watch too much of the awfulness with nothing else happening. In any case, they sucked. In the end, the Doctor manages to play with the power generators and explode a wall, letting the ocean in and flooding Atlantis. A bunch of people escape to the surface like they should have done years before. In the meantime, a classic battle between science and religion was raged, as Zaroff attempts to overcome resistance from the high priests of Amdo. The travelers reveal the goddess to be a sham when they hide behind the statue and impersonate her to save the Doctor and another priest from sacrifice. And, at the end, the Atlantian ruler says that religion is finished because it had caused all of the trouble in the first place. Amdo would remain buried with the city. But it seems to me that it wasn’t religion that had caused the problem, but science and Zaroff’s hubris. It was kind of like the writers forgot what they had actually written and wanted it to be anti-religion, pro-science. But in reality, it was the priests that realized Zaroff’s problems, their belief in Amdo that allowed the Doctor to get away and save the planet (again). If anything, science was to blame for their plight, not religion. So, I felt that the story’s message was a bit contradictory. Not a big deal, I suppose, but the little things add up. The irritating premise, the stupid fish people, the lackluster plot all made for crappiness. And I’m still not really warming to Patrick Troughton. I will admit that I find him humorous, if not a bit whimsical. But his portrayal lacks any sort of serious appeal. He’s witty, but not clever. He’s smart, but not ingenious. In short, he’s just OK.
After a summer hiatus (at this rate, I’ll never make it through all 26 classic seasons), I picked up the Doctor where I left off. Patrick Troughton’s second story. I was rather ambivalent about Troughton’s Doctor after The Power of the Daleks, and this story didn’t do too much to make me like him more. In fact, I found his somewhat childish nature to be irritating. Perhaps I just haven’t gotten in tune with his interpretation of the role. And not being able to actually see Troughton in action (nothing but reproductions so far) probably hasn’t helped. The travelers arrive in Scotland in 1746, shortly after the end of the Battle of Culloden. We see a difference in this Doctor from William Hartnell right away as he apparently recognizes their location and is ready to go. Ben, on the other hand, is convinced that they are in England and wants to find out what the deal is. This harkens back to the time that Ian was convinced the France during the Reign of Terror was home and went off in search of a pub to buy the Doctor a beer. Instead, they end up being taken prisoner first by a group of rebels and then by the British army. Among the group of highlanders that befriend our heroes is Jamie McCrimmon. He seems like a decent enough fellow, perhaps a bit like Ben. He was certainly introduced in a manner similar to Ben in that he was a major player in the adventure. At the end of the Story he ends up agreeing to travel with the Doctor, although he doesn’t know quite what’s going on. At this point, I have a comment on Ben. I was a Ben fan. I liked his chutzpah. But he almost seemed out of control in this story, acting foolish. Tearing up his contract, refusing to go with the other prisoners, insisting the army had no right to arrest him. It is this bit of recklessness that made him appealing to me, but he just made the situation worse. At any rate, the Doctor, pretending to be German, Ben, Jamie, and the Laird (a Scottish Lord, I’m assuming?) are taken prisoner by Grey and Trask, illegally being sold into slavery. Polly and her friend Kirsty, though, elude capture. They hide out in a pit and use their feminine wiles to blackmail Ffinch, and army officer, into helping them. He helps them to reunite with the Doctor. Meanwhile, Ben is busy ripping up his slavery contract and being tossed overboard of the Annabelle slave ship. He manages to get loose of his ties in the water and swim to short where, luckily, the Doctor is conveniently waiting. The plan they come up with is fine: the girls give weapons to the prisoners while the Doctor distracts them. After a battle, Trask ends up in the drink, and the rebels sail the ship away to France. Jamie, however, is left behind as he helps the travelers to locate the TARDIS. After avoiding capture with the help of Ffinch (still feeling blackmailed, I suppose), the TARDIS is found. Jamie isn’t sure where he’s going to go, so Polly and Ben suggest he accompany them. He does, although he seems nervous about it. I’m told by the Wikipedia that this is the last historical story for many years, owing to Patrick Troughton’s desire to differentiate his Doctor from that of William Hartnell. I’m a little sad to see the historicals go, I rather like them. Having said that, I was kind of bored by this story. For almost half of the story, each traveler was in a different location. This made interaction between them a bit sparse and, as is typical, the secondary cast weren’t much to write home about. Trask was like a cartoon pirate, and Ffinch was a wimp. Jamie seems alright, but was not really developed. I think that Polly’s part of the story was the most intriguing, with her cliffhanger in the pit and the blackmail of Ffinch. And then, when the plot to rescue the rebels was hatched I was impressed by her (and Kirsty’s) insistence upon being a major player in the events. Polly really took charge of her role in this adventure, while the Doctor was rather irritating and Ben was foolish. She was almost Barbaraesque, but much less old. Speaking of Barbara, I’m starting to appreciate her more. Overall, the story was ho-hum. Much of the energy that was driving the show in Season 3 seems to have been lost somewhere. Or been redirected somehow. 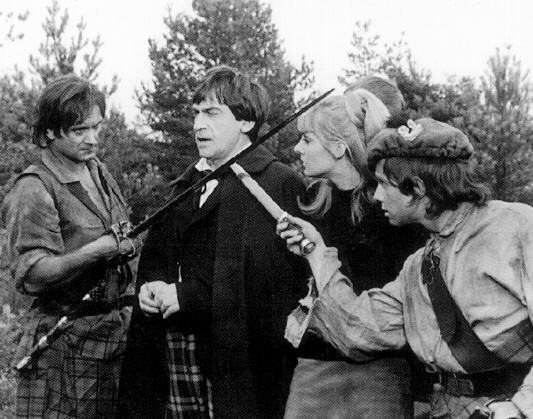 The next story has an existing episode, so seeing Troughton and Jamie in action may help enliven it some. I hope so, because I kept having to rewind after dozing off while watching this one. OK, after being distracted by my current obsession with Bonanza and Twin Peaks, I awoke this morning to three new comments here. When I checked in to moderate the comments, I noticed that there had been 75 hits today. I’m not sure what caused the sudden influx of visitors, but now that number stands at 90, the most popular day yet! Thanks to those who have visited, new readers that have joined in, and the two or three regular readers out there. 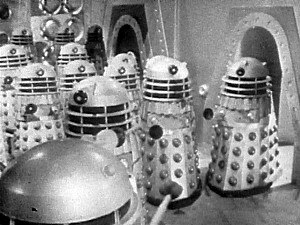 This swell in popularity encouraged me to finally finish and write a post on The Power of the Daleks. This story isn’t too bad, although it goes on a bit long. The 6 episode format does not help this story, there simply isn’t enough story to carry it. I didn’t think that it was a particularly great introduction to Patrick Troughton’s Doctor, I didn’t really get a good feel for his character. It’s depiction of the Dalek’s, though, is quite good. It does a nice job of showing their intelligence and deviousness. The Doctor recovers from his regeneration, explaining that he depends upon “change” and “renewal.” He also points out that it is a part of the TARDIS and he could not survive without the TARDIS. I found this to be pretty interesting. What about the Monk? Does he also have that feature? What if he had to renew himself when his TARDIS was miniaturized? Would he have died? I don’t know whether this ever defined or described in more detail, but is definitely another question worth filing away. Polly is pretty sure that the Doctor is still the Doctor, while Ben is skeptical. I’m not too sure why he was so skeptical — he witnessed the change. Did he think someone had snuck in while he was watching and steal the Doctor, replacing him with this younger fellow? These opening scenes, though, are pretty good. Troughton seems to adopt Hartnell’s wit, playing it coy with Ben, speaking of himself in the third person and acting as if he doesn’t remember, looking for his journal. It was a nice touch to mention his time in The Crusade and his friend Marco Polo, likely in order to assure the audience that he was indeed the Doctor as I’m sure it may have been somewhat confusing. I’m not sure how well the promotional material would have set the viewers up for this change, if at all. I like how the Doctor answered questions by playing a little flute, gave Ben some snarky responses and wanders off on his own. At this early point, I felt like I was learning about the new Doctor. But, for the rest of the story, I found him to be rather aloof. I’m not sure if they were trying to squeeze Troughton in Hartnell’s character, they weren’t yet sure how he was going to be, or if that will become his character. I’m interested to see his development. I imagine that it is difficult to completely re-write a show’s title character. In the meantime, we have the Daleks to deal with. The Doctor finds a murdered man in the swamp near the TARDIS. When guards come to find the dead man, he steals his identity and the human residents of the planet believe him to be an inspector from Earth. The planet is Vulcan…a reference to the real-life planet theorized to be between Mercury and the Sun. Of course, there is no such planet. It became more famous as the home of Mr. Spock (I had originally written Doctor Spock. The pointy-eared Vulcan should not be confused with the famous advice-giving pediatrician.) a couple of years later. As has been the case a couple of times in other stories already, there are rebels threatening the stability of the colony. This is getting to be a go-to device for human space-colonies. It’s a simple way to create secondary character drama and potential danger for the travelers. In this case, we get both. The colony’s government has a couple of moles, one of which killed the real inspector. They are then able to use the travelers as scapegoats, claiming they are working with the rebels. 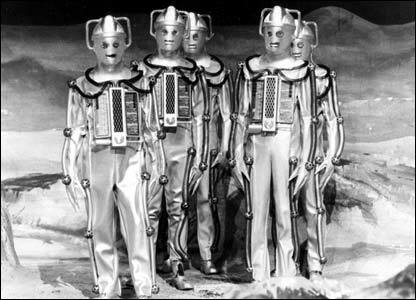 These traitors hope to utilize the Daleks, discovered in a centuries old space capsule, as servants and weapons to overthrow and control the colony. The Daleks are the best part of the story. They are smart enough to recognize the gullibility of the humans, claiming that they are their servants. Essentially, they fool them and lull them to sleep. In the meantime, they are building a Dalek army inside the capsule. They are smart enough to never gather in groups of more than three (the original number), and they build weapons and a power source with the material that they receive from the human scientist, encouraged by the traitorous government official. Of course they turn on their supporters and alleged masters, killing nearly all of the humans on the planet. The only way they are stopped is when the Doctor is able to kill them with a power surge from the power source they had built. I thought this was a good way to stop them and really highlighted their evil nature. Once again, they took advantage of the human thirst for power. They used Chen in the Daleks’ Master Plan, and this time they used Bragen, the man most interested in ruling the colony (and the one responsible for the murder of the Inspector and later the colony’s Governor). Of course, the Doctor knew all along what was happening. But nobody would believe him. 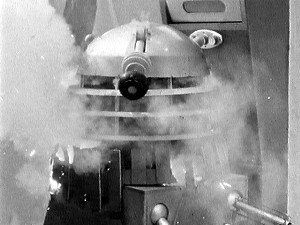 Still in his continuing attempts to well by those who host him and his friends, he sticks around and attempts to convince the humans that the Daleks are dangerous. But, he is put in jail for being one of the rebels and no one will listen. Until the scientist witnesses the building of the Dalek army. But by then it is too late. After killing the Daleks, the Doctor, Ben, and Polly head off for their next adventure. Generally, this story is all right. The length makes it kind of boring, but the nicely written Dalek plot saves it. Ben and Polly play nearly no role (although in some of the pictures it appeared that Polly wasn’t wearing pants). Each is on vacation and misses an episode, and they spend most of their time simply trying to tell the people that the Doctor is right or trying to figure out what happened to the Doctor. As I alluded to earlier, even the Doctor isn’t particularly interesting in this story. While the story is passable, it isn’t much of an introduction to the Second Doctor.